The final scene of the movie Jurassic World has received no attention in the reviews–in fact, it is not mentioned in the film’s synopses that I’ve read. For those who haven’t seen the film, or whose recollection is faded, let me set the scene: The dinosaur theme park, under the supervision of Dr. Henry Wu (of Jurassic Park fame) features genetically engineered super-dinos–“bigger, faster, crueler.” They are the next generation of dinosaur, developed from the T. Rex raptors in Jurassic Park that the good doctor cloned from prehistoric DNA that was preserved in Amber. Jurassic Park engaged in what is now called de-extinction; Jurassic World goes a step further to create a new breed of dinosaur. JPark’s dinos are “more natural,” and that’s the key to the final scene. The crueler and bigger “modern” reptiles have been vanquished by the T. Rex–that’s what the story line is all about. The movie’s final shot is of the victorious animal raising its head triumphantly above the trees. Natural is better–that is a frequent theme in movies, even in sci-fi movies. Back in 1936, Charlie Chaplin’s classic, Modern Times, ended with Chaplin and Paulette Godard walking down the road, away from the world of technology and into a more natural future. More recently, Bladerunner (1992) portrays the conflict between natural humans and genetically engineered “replicants, who were designed to work in extraterrestrial environments that are unfriendly for humans. The replicants are superior in some respects; their grievance is that they have been engineered with a life span of only four years. The outcome of the conflict is ambiguous–two different versions of the film were released, each with a different ending. In Gattaca (the letters are an anagram of the ACGT nucleotides of the DNA molecule), 1997, the plot focuses directly on the competition of two brothers, Vincent, a natural “love child” with a normal number of genetic defects, and Anton, who was screened at the embryo stage and found to be “perfect.” Through several contests, the natural brother surpasses his flawless sibling. The message could not be clearer, Jurassic World being the latest installment. Dr. Wu might even be seen as a Faust figure, the mad scientist, who trades his soul for unlimited knowledge. The Faust story, which has its beginnings at least eight hundred years ago, has taken on many forms (for example, Wikipedia lists more than twenty-five films based on the Faust story. https://en.m.wikipedia.org/wiki/Works_based_on_Faust). It has been intertwined with Frankenstein and the figure of the Mad Scientist, perhaps most vividly in recent decades as Dr. Strangelove, in the 1964 film. The very old story of the Sorcerer’s Apprentice (think of more recent portrayals in Disney’s Fantasia in 1940 and its 2000 sequel) focuses on the technological dimension of knowledge. Johann Wolfgang von Goethe (1749-1832), who created highly influential versions of both Faust and the Sorcerer’s Apprentice, was himself an important scientist. Jurassic World draws upon these deep roots of popular culture as it combines the mad scientist with the horrific hybrid dinosaurs and adds a scheming capitalist who owns the Dino park and controls Dr. Wu. The film ends with the mad scientist and his capitalist patron escaping to live another day, while the “most natural” dinosaur wins a temporary victory over the scientist’s evil creations. The dinos have already killed the security guard who planned to steal embryos, to breed dinos as weapons of war. What are are we to make of this sci-fi expression of doubt about science? Occurring in the most highly advanced science-based society in history? It is not of recent origin, it is an enduring thread in the tapestry of America’s soul. Sometimes critics seem to think that ambivalence about science is a matter of poor education, or they link it to conservative Christianity. I’ve heard the epithet, “stupid and ignorant” used–as if that explained anything. Nobel laureate physicist Steven Weinberg has argued that creationists are responsible for congress de-funding the supercollider. But it goes much deeper, and it crosses lines of religion, social class, and education. Well-educated upper middle-class parents are defying medical advice to inoculate their children against childhood diseases. Ivy League-educated members of congress are reluctant to acknowledge the scientific theory of evolution. 1–Is it possible to counteract deep-lying cultural dimensions, such as the ambivalence to science? Or will they endure forever, even below the threshold of our awareness, waiting to capture our public life at any moment? 2–Is this culture of ambivalence in any way responsible for the scientific illiteracy that bedevils our society? 3–How do religion and science figure in the culture of ambivalence. Although has been popular to speak of a “warfare” between science and religion, today historians mainly debunk the idea. On the one hand, many scientists are actively religious, while on the other hand, the culture of science itself harbors ambivalence. It was the Father of the Atom Bomb, J. Robert Oppenheimer, who questioned physics itself, saying after Hiroshima, “We have known Original Sin.” The filmmakers who gave us Bladerunner and the Jurassic Park franchise are not necessarily anti-science. But they do have their fingers on the pulse of popular culture. After all, the Faust and Mad Scientist traditions have lasted at least 800 years. 4–Is there a kernel of truth carried by popular culture–that unbridled scientific and technological advance can lead to destructive consequences, alongside the blessings they bring? A truth that calls for deeper reflection and nuance? I’ll elaborate on these themes in my next blog. The title is Rabbi Lord Sacks’, who writes that “the battle against Al Qaeda, Al Shabaab, Boko Haram, Isis, and their myriad mutations, will be the defining conflict of the next generation.” His thesis is both simple and grand: The ideas that drive these groups are religious ideas, embodying a seventh century Islamic Apocalypticism; consequently, what is required are religious ideas that can engage and overwhelm the ideology of these groups. Rabbi Sacks has devoted his new book, Not In God’s Name, to this conversation of ideas. As far as I can discern, Rabbi Sacks’ concern is totally absent from Christian churches today. Thinking and its by-product, coining ideas, are not high on the churches’ agenda. We are geared up to condemn the jihadist groups, to label them as evil, to mobilize military forces against them, and to affirm “moderate” religious groupings. These responses are not constituted by any new ideas, nor by religious ideas. If ideas can be said to underly our responses, they fall into three forms: (1) we are good, our opponents are evil; (2) “moderate religion” is better than “extremism”; (3) if we don’t destroy them first, they will destroy us. These ideas may be factually true, but they are not ideas likely to turn the tide of history in ways that we need today. The challenge posed by Sacks is formidable and also intriguing. More than gut-level responses, it calls forth serious theological and philosophical thinking. I have no high pretensions, but I have, after all, devoted my life to such thinking, and I feel some responsibility to take the Rabbi’s proposals to heart. In this installment, I shall focus on one such idea: Religions must grow beyond their present sect-like thinking and behaving. Religion is not essentially sectarian, but rather universal, and while it takes innumerable distinctive forms, religion is a network or league of equally sacred individuals and communities. These communities are dedicated to discerning and obeying what they perceive as the deepest and truest in life. All religious people are kin in their commitment to foundational values. The burgeoning inter-faith movement is a witness to this new understanding. Why do I say this is a new understanding? After all, over two hundred years ago–in the late 1700s–Gottfried Lessing wrote his play, Nathan the Wise, whose centerpiece is the Parable of the Three Rings. Briefly, the parable symbolizes the religions of Judaism, Christianity, and Islam as three identical gold rings, which are bequeathed by a father to his three sons. Since the rings are indistinguishable from one another, when the sons seek to determine which ring is the original, they are told that the quality of each ring is found in the life of the wearer, whether or not it is lived in ways that are pleasing to the father. After two centuries, this idea has scarcely taken hold among the various religious communities. So far as I know, none of the world’s religions acknowledges equal status to other religions. Each of the major religions has constructed a narrative to explain the other religions, and each is accorded inferior status–only “our” religion is the truest and most revealed religion. My own Lutheran Church emphasizes ad nauseum the uniqueness of Lutheranism. We do not inculcate our children with knowledge of what they share with other Christians, let alone other religions, but rather with their distinctiveness from the others. Every Protestant church has a theory of how and when Catholicism ceased being the true church, and Catholics can reciprocate. Similarly, every religion has a theory that explains its superiority to others. No religion has a doctrine describing the equality of other religions–in other words, no parable of the three rings. In proposing this idea of religion, I am focusing on an idea that, while it is held by many who do not identify themselves as religious, has hard going among the religious. Much hard work is required before the idea of the equality of religions takes hold among religious folk. But unless it does take hold, the witness of religion to the world is blurred. In the present situation, each of the religions is in effect behaving as if it were a sect–even though they would vehemently deny the fact. A sect is a group that accentuates its identity–at times, even obsessively–and constructs clear and complex procedures for relating to other groups. Such a group considers itself to have a quality of truth that is higher than that of its peer groups, and it has a clear sense of how it has come to possess its truth–often rooted in a designated lineage that leads back to divine revelation. Sects not only believe that good fences make for good neighbors, they also insist that the fences be well-built. The stakes are high for a sect, because it has a vision of truth and it strives to remain faithful to that truth. Religious communities are not essentially self-seeking or self-aggrandizing, even though some of their adherents may be just that. These communities are sincerely devoted to a truth that transcends their immediate existence–truth that is ultimately rooted in God or in what the group believes is the ultimate reality. Each community believes that relationships with other groups will alter their identity and, in some sense, dilute its truth. The real challenge for a religious community is to define its truth in such a way that the truth is enhanced, not diluted, by relationships with other groups. Such re-definition is a serious and difficult matter; it requires intellectual, theological, and spiritual depth, together with the will to change. Is my Christianity cheapened if I believe that God has spoken just as authentically through Muslim or Hindu traditions? Or if I believe that I have something to learn from Jews and Buddhists? I have often wondered how Christians can believe that their God of love would consign billions of people to error, simply because they had not heard about Jesus. As long as the religions of the world act like sects, denying equality to other religions, the Muslim jihadist sects are confirmed in their belief that they are in competition with the other sects and that they are destined to win the competition. begins, at least, to get at the task of framing the new ideas that Rabbi Sacks speaks of. The point here is not that the Jihadists are not truly Muslim or that they are opposed to Christianity or Judaism or any other specific religion. The point is that the Jihadists are a threat to the human consensus of what is deepest and truest–as witnessed by all the world’s religions in concert. Making this point forcefully and in concert is the challenge to all religious communities and individuals. Of course, each religion will state this consensus from its own body of wisdom or revelation. When this consensus is clearly and forcefully asserted, then the Jihadists are put in their place as they should be–they are anti-human. Not anti-capitalist or anti-western or against any specific religious community, but in opposition to the human understanding of deepest truth. When such a statement is made, non-religious people who stand for true humanism can and will join with the religious consensus. As long as the religious communities speak and act as sects, the broad range of humanists have difficulty declaring solidarity. What I have written here is but a rough draft and a personal attempt to comprehend a challenge that demands enormous intellectual and spiritual effort for its resolution. But it is high time for the religious communities of the world to give attention to ideas, and ideas that are helpful in meeting basic challenges that face the human community in general. Pope Francis has taken such a step in his recent encyclical. It may be that my feeble attempt here can also be of use in our facing the challenges of the environment, as well, since the environment is also a defining issue for our time. But that requires a different discussion. The mind is a strange thing. I was sitting today in Sunday worship, receiving Communion bread from the silver plate that the pastor held–and suddenly Julie Green popped into my mind, overlapped a nanosecond later by Judy Chicago. I tried to put these dissonant images out of my mind, but it is now six in the evening, and I realize that I must write this blog installment. Judy Chicago came to my attention through the exhibit (in Chicago) of her 1979 work, “The Dinner Party.” This work is an immense open table set with thirty-nine place settings, thirteen on a side, each commemorating a goddess, historical figure, or important woman. It was, without doubt, the silver plate of the Communion service (technically known as a paten, which means “plate”) that brought these images to my mind–even though it is the “divine food” on the plate that is significant: the bread/body of Jesus, on his own death row, shortly to be executed. Meals have been symbol-laden throughout human history, but Judy Chicago and Julie Green focus on plates as symbols that point to very specific realities of our lives. In her own words, Green says, “I am inspired by contemporary society. I research, and then, I point. 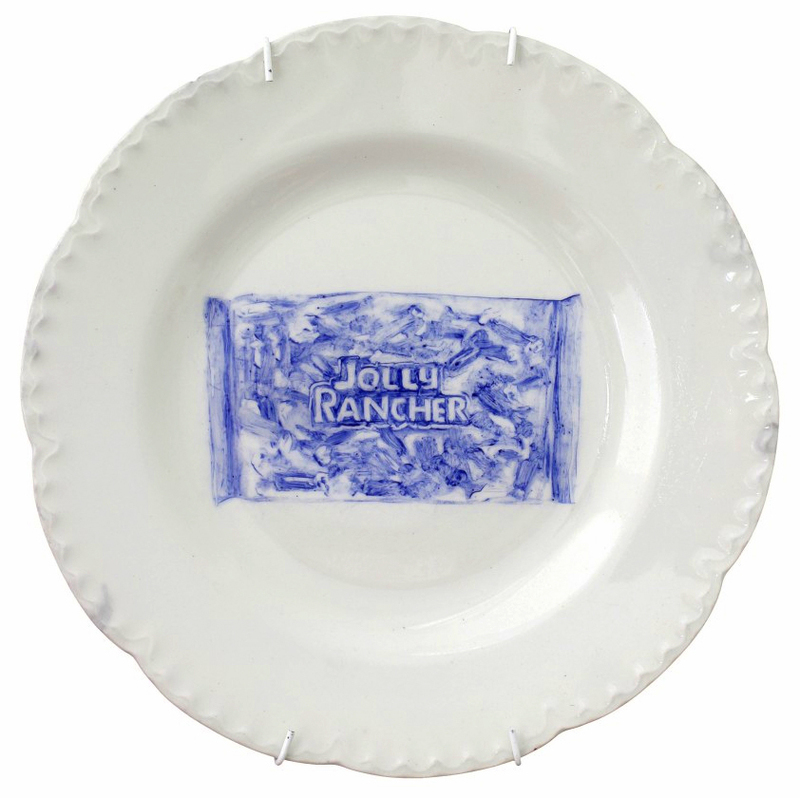 This is true of all my work.” Her plates point to the reality of capital punishment, in a very mundane manner. She sees her plates as a “quiet” protest. She doesn’t plan to stop making them until capital punishment is abolished in the United States. Green devotes six months each year to her plates, intending to produce fifty each year. Judy Chicago “points” as well. Each plate points to a woman of importance who deserves to be remembered. The gigantic table with its thirty-nine plates points powerfully to the fact that these and all women have been relegated too often to second-class status. The tiles in the floor register the names of 999 additional women. The sacraments of the church also point. The bread on the plate points to Jesus at the critical moment of his life–his violent death, executed. It points, as well, to the significance of his death. He died in the course of, and because of, a life that embodied commitment to what is most profoundly important in life–justice and caring deeply for his fellow humans. We can identify with death row prisoners, just as we (especially women) can identify with the women assembled for the Dinner Party. We identify with the executed Jesus, too. We recognize that death is crucial for our lives, as well. We hope against all odds that in our deaths we will share in resurrection and union with God, as Jesus did. All three of these plate-symbols and the meals that accompany them are community meals, not solitary. These symbols remind us that we live and die in community–even if we sometimes feel that we are in solitary confinement, living lives of anonymity. Green and Chicago underscore–rather, their plates cry out–that we must care for one another and that there is a community of those who care for us, no matter how low our social standing. I see Jesus and his meal standing within the symbols of Green and Chicago. For me, these two artists provide clothes for the Jesus-symbol. The sacrament of Holy Communion accepts these two studies of contemporary society and points with them, as well. Both Green and Chicago went to a lot of effort to learn how to paint on plates. Such painting has a long tradition, but it is a “common” tradition, belonging to women, that has not been respected. It is frequently spoken of scornfully as “arts and crafts.” The artists submitted themselves to the discipline of this plate painting, and they recognized that it is truly genuine art–fully as much as the work of those men who scorned it. There is deep pointing here: the bread on the sacramental plate is common bread; the body of Jesus is a common body; our bodies, we who eat at these three symbolic meals, are common bodies–full of commonness. Our communities are common, mundane. These symbols point to our hope–that our commonness will be embraced by God and through death will never die. Art cannot be exhaustively explained in words; nor can a sacrament. But there is meaning there, deep meaning. Reflect on the strangeness and unlikely connection of these three: Julie Green’s Last Supper, Judy Chicago’s Dinner Party, and Jesus’s Meal of Holy Communion. I’ve been aware of homeless persons ever since I worked in a church in Albuquerque and then moved to Chicago in the 1950s. My relationship to them was mainly to give them a few dollars or buy them a sandwich. The church had a discretionary fund (the “Good Shepherd Fund”), which allowed me to send them to a diner across the street. We had an agreement with the diner that anyone we sent would be served a meal, billed to the church. I officiated at two burials, arranged by a charitable mortuary, for homeless men who died with no known relatives. When I lived briefly, in the 1980s, in Berkeley, California, where good year-round weather attracts people who are down and out, I noted that the city set aside areas where those who lived in their cars could park unmolested for the nights. The sprawling university campus offered many secluded spots for sleeping. But I never probed more deeply into the issues of homelessness. 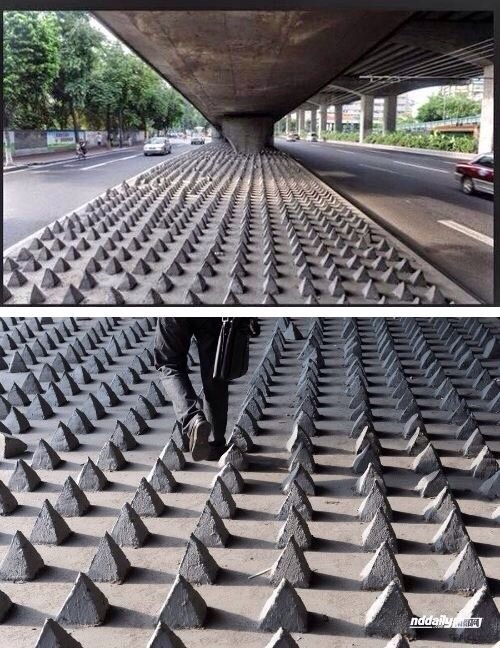 I know that homelessness is a problem for cities, but it never dawned on me that we would lay down beds of spikes to make open spaces unsleepable. A Google search reveals that cities around our country and in Europe are taking recourse to spikes–see the internet links at the end of this piece. We know that homeless men and women want to live in decent lodgings, but for many reasons cannot–poverty being the main reason. We don’t provide housing (dormitory-like shelters don’t qualify as proper housing), but we want them out of sight. As one blogger writes, “we should not presume to think that sitting and sleeping is the only major front that People Who Surely Don’t Have Anything Against the Homeless But Would Rather Not Be Reminded Of Their Existence are waging.” (http://vsbrian.com/2014/06/10/war-on-homeless/). In 2006, Orlando, Florida, passed an ordinance against feeding the homeless in public. Several charitable groups have been the object of legal measures taken by the city to halt their efforts to provide food for the homeless who had settled in a public park. What’s the underlying issue here? We have come dangerously close to accepting the homeless situation as a problem that we just can’t solve. We don’t seem to have the will to solve it. Susan Sarandon gives us a clue: “If you walk down the street and see someone in a box, you have a choice. That person is either the other and you’re fearful of them, or that person is an extension of your family.” Homeless men and women are the Other, and since pre-historic times we have been unable to live satisfactorily with Others. We’ve frequently killed them, ostracized them, persecuted them, and otherwise gotten them away from ourselves. Some communities don’t want mosques in their midst, or half-way houses, or homeless shelters, or food pantries. Jesus said and did a great deal about the Other. He spoke about the Neighbor and love for the Neighbor. When he was asked, “Who is my neighbor,” he pointed to every person we meet. Susan Sarandon had it right when she compared the Other to our family. Today, the Others are getting closer and closer. In previous centuries, white Europeans went to the lands of the Others and dominated them in imperial fashion. Now the Other has come to Europe and the United States–and every nation involved is feeling threatened. Britain no longer accepts every resident from a Commonwealth country as a citizen. Germany restricts rights of the Turks (mostly Muslim), who came in the 1950s because Germany suffered from a labor shortage. France, Denmark, and others experience frequent protests against foreigners. The European Union wants North African countries to prevent refugees from sailing to Italy. Trends indicate that within forty years white Americans will be only a minority of the nation’s population. We recall that we welcomed Africans to our shores, beginning in the 1600s and continuing until the 1860s–as slave laborers. As I write, Baltimore is being devastated, as was Watts, Los Angeles, and the west side of Chicago in the mid-1960s. These are upheavals against the Other, far from viewing them as family. You may not agree that the homeless are viewed by many of us as Other, not neighbor, not family. But I cite Dennis Kucinich: “We have weapons of mass destruction we have to address here at home. Poverty is a weapon of mass destruction. Homelessness is a weapon of mass destruction. Unemployment is a weapon of mass destruction.” I would add that lack of sensitivity for and defensive action against the Other are also weapons of mass destruction. We have a deep spiritual issue–alongside the political and economic dimensions–and I am quite sure that spikes are not the answer. I named this blog series Liftthescreen to indicate that my postings would be part of my attempt to get a clear view of things. I made that decision at age 78 (in early 2011) when I moved into a retirement facility. Some cultures, the Hindu, for example, have clear concepts of the stages of life, as well as the activities and values that belong to each stage. I am at a stage of life where a clear sense is particularly important. Not that I have that sense, but that I strive for it. What I did not know when I moved here is what a special vantage point is offered by a retirement community–what we used to call an “Old People’s Home.” Of course, that term, OPH, is decidedly politically incorrect today. People retire, they mature, and they age, but never ever do they grow old, it seems. I try to avoid euphemisms, since they are strategies for screen-lowering. I have no problem saying that I live in an OPH. The term “clear sense” reminds me of a lecture I heard 60 years ago, almost to the day. The lecturer was one of the wisest of my seminary teachers, Grady Davis. He recounted a visit to a parishioner, in the hills of Tennessee, who was in pain on his death bed. The doctor asked if the man wished to be sedated, to which the dying man responded,”I will not be deprived of what may be the greatest experience of my life–dying.” We may not agree with the man, and none of us can predict the moments of our own dying, but the story grasps me now, at age 83, as it did when I first heard it at age 23. Many of us–for reasons beyond our control–will not die with a clear sense, but we can strive for clarity in the days remaining to us. The residents here are all in the same stage of life; we have finished our active careers, we have given our lives for whatever it is that we were called to do–whether called by our ideals or by circumstances we couldn’t control. The residents here are coming to terms with the worthfulness of their active lives, knowing full well that they are in a different, carefully controlled environment now with people they mostly did not know before they moved here. They wear with varying degrees of public expression their pride, their disappointment and grief, and their aspirations for the remaining time of their lives. In terms of economic-social class, the wealthy live alongside those of more modest means. The condition of their physical health varies from person to person. Those who were at the top of the local pecking orders in their previous lives often try to attain same top spot here. People whose lives were particularly lonely and difficult before are mostly grateful and even cheerful to be here living in relative comfort. Religiously, you will find skeptical atheists, Jewish Holocaust survivors, those who go to Mass every morning, active Unitarian-Universalists, and even Lutherans (two of whom are ordained clergy). The full-time chaplain is provided by the Episcopal church. I believe there are a few Republicans here, but they are overwhelmed by a sea of liberal Democrats. One thing that everyone in our community shares is that we will die here or in one of the local hospitals. We watch each other’s lives unfold, and we watch everyone on our journey towards death. At this moment, four photographs are on display of residents who have died in the last few weeks and whose memorial services are pending. Some of these people I knew quite well, while others were hardly even acquaintances. An acquaintance since graduate school sixty-five years ago and one of the most popular residents is clearly in his last few weeks, or days, of life. Perhaps this sounds sad, even morbid. However, our residential community is not at all sad or morbid. There are sad individuals, to be sure, but the general mood is vigorous and often upbeat. My granddaughters talk about it as a resort hotel, since it is only 200 yards from Lake Michigan, with its parks and beach. I hope that none of you readers consider this piece to be morbid or sad. I intend it simply to be clear-eyed and in its own way, honest. Gratitude first, and then the unfathomable–what is the design of God’s mystery? In a way that I had not expected, living here provides a rich context for reflecting on the design of it all. A retirement community is a veritable laboratory for developing pastoral insight. Every year, senior medical students, in their family medicine rotation, come to talk for a couple of hours about how I view death and dying. Inspirational stories are here–my long time friend Clara, when, at age 90, she received the diagnosis of terminal lung cancer, shunned all treatment and concluded that she had lived a blessed life; she lived peacefully for more than a year before she died. At the other end of the spectrum is the woman so frightened of dying that I steer my conversations with her accordingly. Last year the Chaplain organized a series of discussions of dying. Most of the talk was about filling out End-of-Life forms; there were complaints that “My grandchildren won’t talk to me about death.” Very little testimony about our personal views of death. I should say that the Chaplain is developing more productive conversations. As I write, she is attending a week-long seminar for this purpose. The Chaplain is going against the stream. The national association of continuing care communities recently eliminated the term “continuing care,” because prospective residents don’t like the implication that they need “care.” My own OPH is following the advice of their marketing consultant to change our logo slogan from “redefining retirement” to “engaged living.” And they do not mean engaging the final stage of life. Please carry on the conversation–with me here, if you wish. Perhaps (no promises) I’ll write a later blog that includes your comments. This is my last word–for the moment. I have written about this theme in previous blogs–see September 2013, for example. In the meantime, some of these thoughts were in my mind when I wrote this poem few weeks ago, as I watched an ambulance pull up to our front entrance. Those of you who do not follow the zigs and zags of life in Chicago might be interested in the May madness that is about to descend on our fair city. I am referring to the National Football League Draft Day event that is coming up in a few weeks. Even those of you who are avid–or should I say obsessive – professional football fans may not be aware of the magnitude of the Draft Day comings and goings–April, 24-May, 6. Today’s (March 17) Chicago Tribune will give you a blow-by-blow account. The city fathers consider hosting the Draft a real coup. Previous Draft Days have been held at New York’s Radio City Music Hall. For two weeks, one of our major thoroughfares, Congress Parkway, will be closed from Lake Michigan to Wabash. The point is to clear the way so that the Gladiators-in-waiting can parade in unobstructed columns from Grant Park to Louis Sullivan’s historic Auditorium Theater, where the the first three rounds of the draft will take place. Chicagoans, as well as the thousands of visitors, will be awed by the sight of red carpet covering Michigan Avenue. The shapely Adonises will approach the actual proceedings like the Hollywood Stars gliding into the Oscar ceremonies. The athletes will not be in designer gowns, but they are mandated to don expensive dark power suits with designer ties. Since most of them, in the course of the Draft Days doings will become certified multi-millionaires, they can well afford the coifs, the suits, and the neckties. Some few may be worried that in their retirement a good deal of their largesse will eaten up by the care they will need for the broken bones and concussions that go along with service to the National Football League. But the click of the cameras as they pass and the adoration of the crowds lining the street may banish their worries. Since theater space is limited, intermissions are scheduled to allow devotees to pose with the candidates for photos and autographs. The plan is to attract at least two thousand school boys to the Draft Days, and whose heart would not be warmed at least a few degrees by those boys (and their parents) asking for autographs? Come fall, will those boys and moms and dads be partying at the bacchanalian tailgate parties preceding every Bears’ home game? Someone somewhere–perhaps backstage at the Auditorium–is betting on it. The remaining rounds will be outside across Michigan Avenue in what Chicagoans know as Congress Plaza. For two weeks in April and May, that plaza becomes Selection Square. Bleacher seats will accommodate those fans lucky enough to get reservations. The pot will be sweetened for the school boys and their families. Large areas of Grant Park have been “reserved” for football clinics. The boys can get tips from local coaches and NFL players on how to rock ’em and sock ’em. In case you’ve forgotten, that’s old fashioned language for what goes on in football. That’s what Knute Rockne enjoined upon his troops at Notre Dame in the good old days of the Gipper and what Ronnie Reagan in 1940 simulated in his movie rendition of the Gipper. Rockne and Reagan didn’t know about football concussions in their day, and the football families in Grant Park this May will be urged to forget what they have heard about the natural consequences of football violence. The area in which the clinics are held in Grant Park is christened “Draft Town”–portioned out in fifteen football fields, NFL players will be available for autographs in this area, alongside a Super Bowl museum. High culture will play its role, too. The Art Institute lions will be appropriately festooned, with helmets rotated so as to represent all the NFL teams. As each team makes a choice, its colors will flow in Buckingham fountain. Why this Madness? Because the NFL draft will bring big money into the city treasury–and we do need money–thousands of tourists who will spend in our restaurants and hotels. The League makes demands: its bid to hold the schoolboys clinics in Soldier Field was refused, but there are also requests for such perks as free meeting space and police escorts. The city officers say that Chicago has wooed the NFL in the same manner as a big convention, and many perks will be funded from private sources, at no cost to taxpayers. There is no way to verify these statements, since the department of tourism which handles these matters has been spun off as a non-profit organization that is exempt from public records laws. Reading about the NFL Draft Days is like stepping into a cartoon, or perhaps more a comic book. Fifteen football fields? Red carpet on Michigan Avenue? Twenty-four different color combinations spiraling in the air from Buckingham Fountain? There are those who say that the NFL is all show, all image–and no constructive substance. In recent years, the League has nurtured abuse of women, extra pay for injuring opposing players, ignoring the problem of concussions, and cutting adrift retired players whose earnings don’t cover the medical costs incurred by injuries they received in their playing days. In every one of these situations, the NFL stonewalled until pressures forced action. At least two star players have been suspended for domestic brutality, and a commissioner was hounded from office. A coach who encouraged rewards for injuring opposing players was suspended for a year. It took the public outrage of “da coach,” Mike Ditka, to give attention to mistreatment of retired players. The NFL wants its brand to be number one in the world, up there with Apple, Face Book, Michael Jordan, and Madonna. As of this date, none of those brand names have earned red carpet treatment on Michigan Avenue or closing down a major thoroughfare for two weeks. In his playing days, Michael did bring tourists and millions of dollars to our city, but he didn’t have our municipal necks in a vise in the way the Bears & friends do. I will not indulge in extensive commentary–I think you readers will supply that. I won’t even promise to update you on the Second City’s Spring Madness, and I won’t be interviewing people on the red carpet. But I have alerted you to it.